Hello, winnie & walter friends! Vanessa here today with a card made with a lot of masking. This technique makes it possible to create depth without having many layers. For my card, I used The Big, the Bold and Extras, Scenery:Big Bang Confetti and The Big, the Bold and Blessings. I started with a panel of watercolor paper. First, I stamped a flower image, masked it and stamped the next flower, masked both and stamped another one. This way, I stamped all the flowers and the banner. 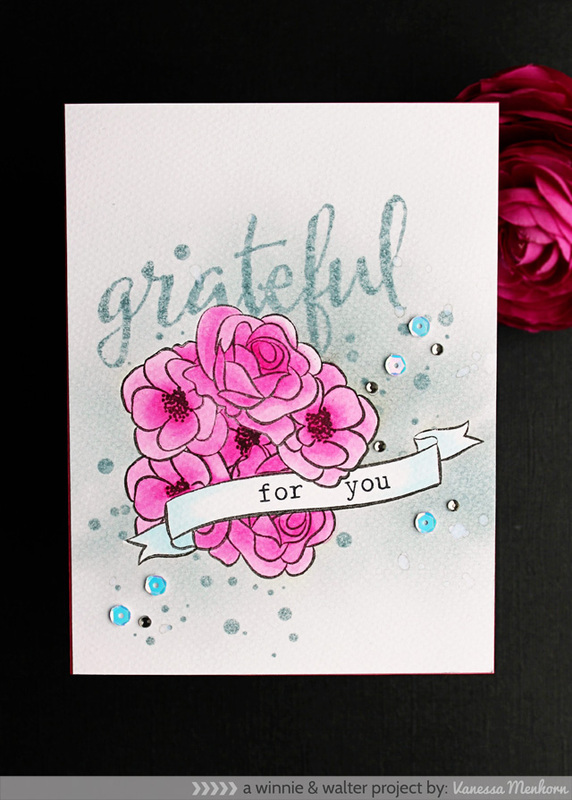 When everything was stamped and masked, I used an ink blending tool and applied Ranger Distress Ink onto the panel and stamped the dots and the "grateful". Now I removed all the masks and colored the flowers and the banner using Distress Inks and water. To finish the card, I adhered some sequins and rhinestones. Masking is such a fun technique, I hope you'll try it yourself! Thank you so much for stopping by today! I hope to have inspired you! GORGEOUS card Vanessa - it is PURE MAGIC - LOVE IT ALL!!! Awesome card Vanessa! Your flowers are gorgeous! just gorgeous card Vanessa. Great effort, the results are well worth it. Beautiful masking...love the striking flowers. So gorgeous! I loveeeeeee the colors!!!! !